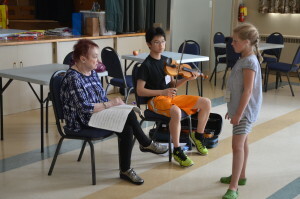 Inspired by the pedagogical philosophy of Shinichi Suzuki, Ottawa Suzuki Strings provides a learning environment for children that encourages and supports them in their pursuit of personal excellence, and that nurtures the development of their musical abilities and also their human spirit. Thank you for your participation at the recent Annual General Meeting, which was held at Woodroffe High School during group-classes on Monday, November 19, 2018. We have posted here draft minutes from that meeting, as well as the financial statements for the last fiscal year, which were formally approved at the meeting. Thanks especially for those who were able to attend the meeting in person. There was lively discussion, and ideas brought up by parents which will require follow-through during the rest of this school year. Thank you for your participation at the recent Annual General Meeting, which was held at Woodroffe High School during group-classes on Monday, November 20, 2018. We will post draft minutes from the meeting when they become available. In the meantime, we have posted here the financial statements for the last fiscal year, which were formally approved at the meeting. I am happy to invite you to the Annual General Meeting of Ottawa Suzuki Strings, which will be held on Monday, November 19, 2018, at 7pm in the cafeteria at Woodroffe High School. We need your participation at this meeting. If you cannot attend the meeting in person, please fill in a Proxy Ballot, and give it to the school, either to the duty officer, or else Deanne or Judy, prior to the meeting. There will also be a table outside the cafeteria where you can leave your Proxy Ballot just prior to the meeting. At this meeting we will present the Financial Report for the previous fiscal year, which ended June 30, 2018, prepared by our accounting firm, OHCD. We will also elect the Board members for the coming year. If you are interested in serving on the Board, please contact me (contact information below). See the Meeting Agenda, and the Minutes to last year’s Annual General Meeting. The Proxy Ballot form, the Financial Report, Meeting Agenda, and Minutes from last year are all available below. The Annual General Meeting of Ottawa Suzuki Strings was held on Monday, November 13, 2017. Thank you to those of you who attended and participated at the meeting, as well as to those who completed Proxy forms. See below for some of the information about the meeting, including a draft copy of the Meeting Minutes, and the Financial Report for the previous fiscal year, which was approved at the meeting.